A mention of the word Danggit in Filipino company is usually met with grins of delight and expressions of Lami-a uy! Sarap yan! and so on. This same word in the company of expats is met with groans and expressions of disgust. This is an article about Danggit, well the live one anyway, and its place in fishing here in the Philippines. The word Danggit is a well-known name in Visayan for one of the many species of Rabbitfish inhabiting Philippine waters. Rabbitfish are also known in English as Spinefoots, and are known by many different names around the rest Philippines. Some of the names of the more well-known species include: Samaral, Kitong, and Danggit. These fish are primarily a saltwater fish however they can be found in estuaries and even up stream in freshwater rivers. They also range in size from small almost minnow size fish to large kilo size fish. They all are generally round and compressed in body shape with small mouth bordered by lips that look as if they are ready to kiss. They range in color from mottled brown and green to silver, spotted, streaked and ever darker with more dramatic colors. Rabbitfish all possess painful sharp spines all over their bodies. This is the reason they are called Spinefoots. A prick from one of these venomous spines leaves a throbbing pain for a long while. Fishermen need to exercise caution when handling this fish for that reason. The mainly vegetarian diet of the Rabbitfish leads them close to the shore line around the country in search of seaweed and other plant matter. They often come in with the tide to shallow water to harvest the seaweed growing on the tidal flats. They often travel in schools which can be easily identified by the slivery flashes of the fish as they feed in schools on the algae on the seabed. Rabbitfish are edible and make for fair table fare. Local favourite recipes for Rabbitfish include; Grilled Kitong (stuffed with onions and tomatoes), Steamed Kitong with Sweet and Sour Sauce and Fried Kitong. 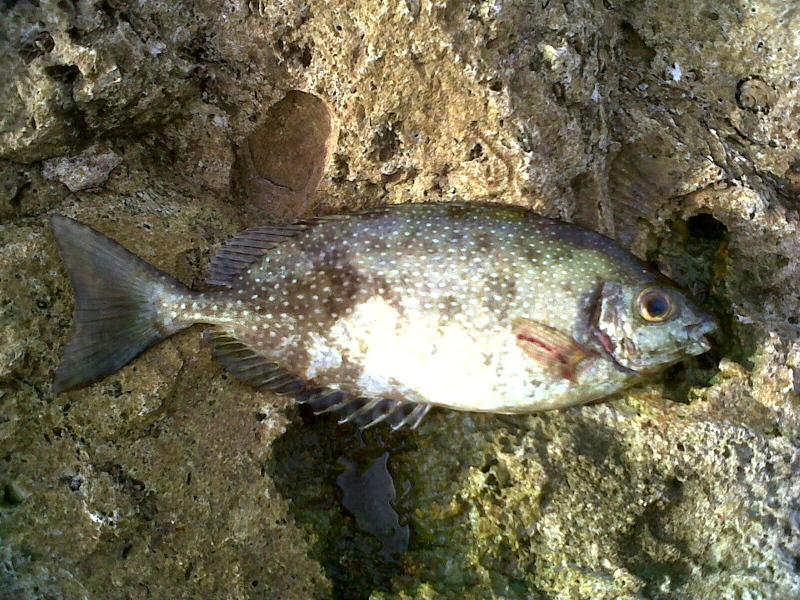 Small Rabbitfish are also a popular fish to salt and dry. Known simply as Danggit, these dried fish are then deep fried and eaten for breakfast lunch or dinner. My wife calls it her Philippine bacon. 😀 When the dried Danggit are fried there usually a pungent fishy smell that hangs in the air. This is usually what deters most foreigners from enjoying this Philippine delicacy. Float Fishing – The small mouths on these fish along with their sharp algae scraping teeth present a challenge that frustrates and deters many fishermen. There however is a technique for catching Rabbitfish that works and with a little practice angler both you and old can enjoy the thrill of fishing for Rabbitfish. Making a Danggit Rig is the first step. The rig includes a float with a swivel attached beneath onto which two lengths or at least 18” of light leader line are tied. Two small split shots are pressed onto the lines near the ends and then two long shank hooks of the smallest available size are tied at the ends. The long shanks help keep the fishes’ teeth from cutting the main line. There are two favourite baits for catching Rabbitfish. The first and most popular is the boiled cooking banana (Saba) and the other is glutinous rice. Rabbitfish seem to prefer these sort of baits though than can be caught on other things. Once small pieces of banana or sticky rice are cut and placed on the end of the hooks the rig is ready to be cast. Local fishermen often chum the spot there plan on fish both before and during the time they fish. Rabbitfish feed throughout the day and so can be caught all day long. 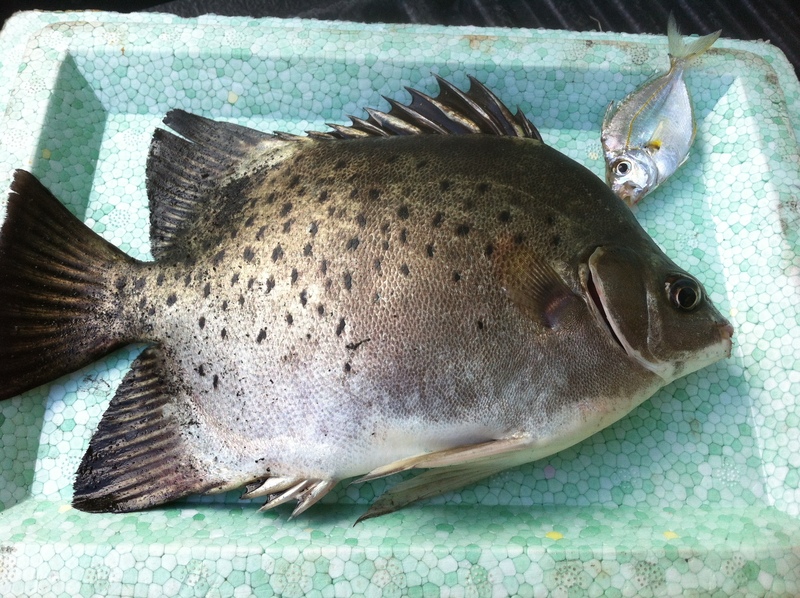 In areas where large predator fish are present small Rabbitfish when caught can be used as live bait. Salvage – Another less palatable way that local fishermen catch these fish is by using specialized “salvage” rigs. 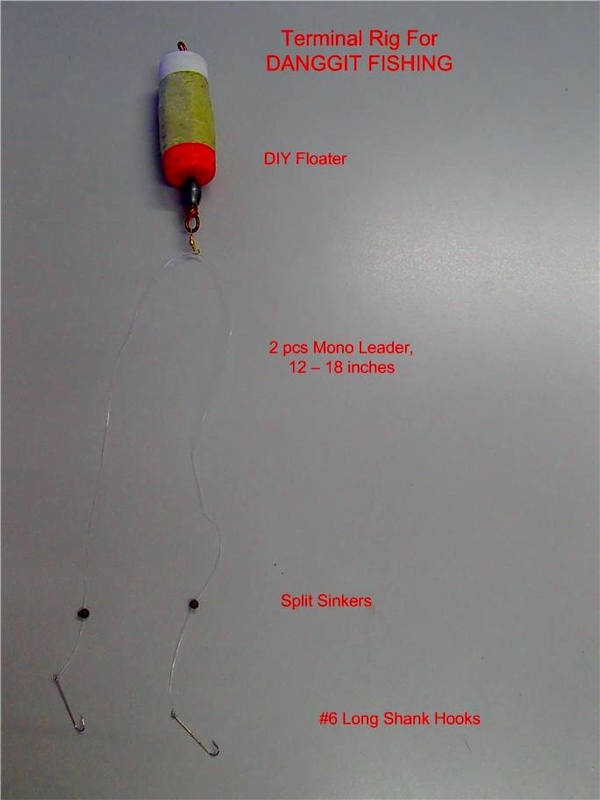 This rig is designed to attract the fish to a bait which has two large hooks behind it. When the fisherman feels the Rabbitfish nibbling on the bait they jerk the line in attempt to snag the fish on the large hooks. This is obviously not a method used when fishermen are practicing catch and release because it often leaves large wounds in the fish. The local sport fishing community looks down upon such a method because of that harmful result. 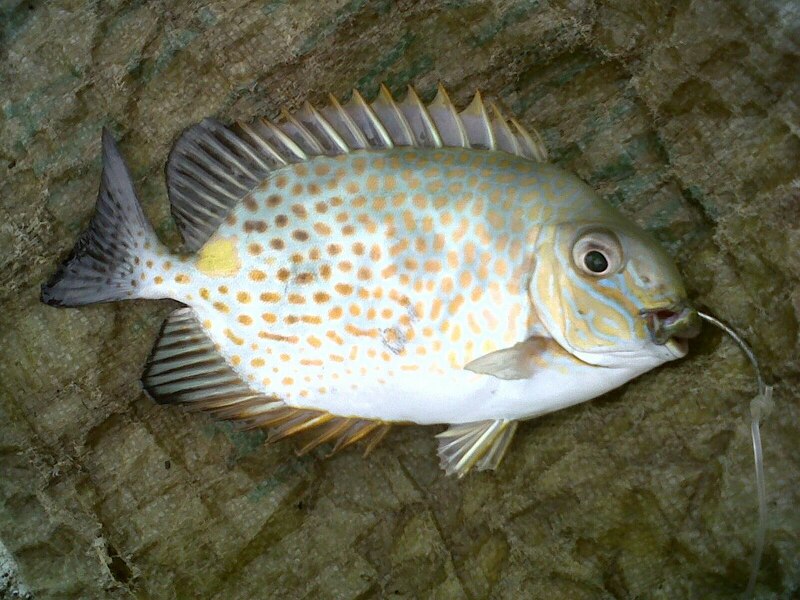 Pana – Because of their large round profiles, Rabbitfish make great targets for spearfishermen. They are also not a very shy fish and will often swim within spear distance of fishermen. Locals use homemade spearguns made of a piece of wood, a length of stainless steel bar and rubber straps. Spearmen either swim along shorelines, rocks, or reefs in search of fish or they set a bait in a good area and wait for the fish to congregate. This is a Kitang which can also be caught when fishing for Kitong. Now you know the basics of fishing for Rabbitfish. Posted on September 7, 2014, in Uncategorized. Bookmark the permalink. 1 Comment. 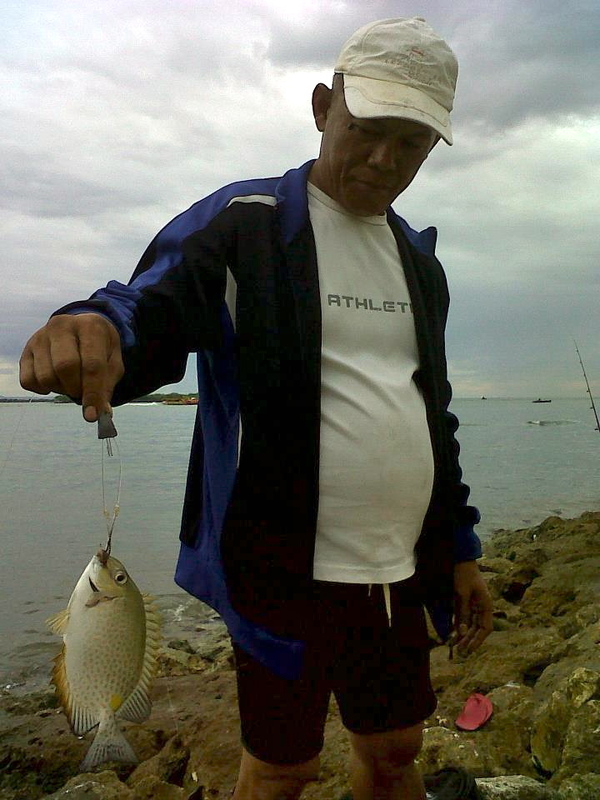 in cuyunon the first fish was a ‘barangen’ which has several subspecies that differ only in coloration and design of whorls and spots. the second photo is a ‘bararawan’, again in several subspecies. the last one, called ‘kitang’ in tagalog, is ‘kikiro’ in cuyunon. 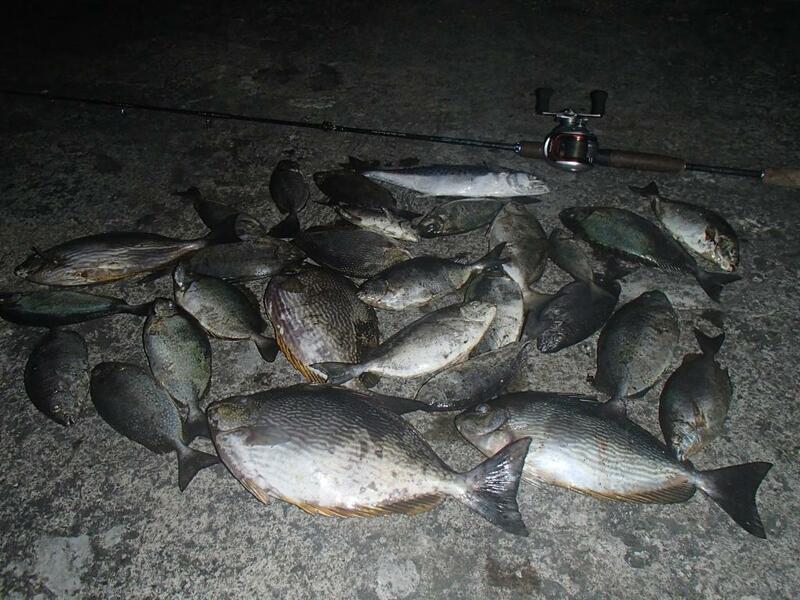 just in case you see some samples caught in any pier in north palawan.